Gloucestershire has always had strong links with Russia thanks to a very active Twinning Committee on the County and Borough Councils. So after Perestroika, when Russia’s Education Departments wanted to link with those in other countries, it was natural for them to contact the GCC. At this time I was a Headteacher in a Gloucestershire Primary school and I was very keen to travel. I was also fascinated by different schools and their pedagogy. I had already linked with a school in Kenya and found that experience life enhancing. So, when the opportunity was offered to go to Moscow and link with schools in Sochi, I signed up straight away. We had a crash course in Russian with a wonderful lady called Sheila who had previously worked at GCHQ. She assured us that this would help us to ‘get by’ once we went into schools. Fortunately she was coming with us and would be our guide for the first part of the visit, and she made all the travel arrangements. So it was that I finished school on the Friday afternoon and headed straight for Heathrow for a very early flight to Moscow on the Saturday morning of half term. After a delay the plane took off, flying over Denmark and the Baltic Sea. I sat next to a Mongolian man who was very quiet for the whole 41/2 hour journey! When we finally arrived in Moscow’s rather dismal airport, it was desperately cold. Fortunately we were met by a guide with a nice warm car and we were whisked into the city. The route between the airport and the city in 1995 was very drab with grey trees (silver birch), grey blocks of flats (hardly any private houses then), trolley buses grey with grime, and a few old Ladas. Very few Russian people could afford cars at that time so the roads were very quiet. Trolley buses were the main form of transport along with the fabulous Metro system. We did see some quaint old dachas along the airport road. Like wooden summer houses, or grand garden sheds, these all had a piece of land around them. A left over from Soviet times, the dacha was where the Russian people could grow their own fruit and vegetables, and keep chickens to supplement their diet. Our evening meal reminded me of a convent I used to go to. There was no choice or menu, just a salad starter then rissoles with cabbage. This was followed by tea without milk. Afterwards we congregated in the room with the most spectacular view over Moscow’s old onion domed churches, and drank lovely Russian Champagne, which at £2 a bottle was half the price of a bottle of water! I shared a room with a colleague and being very tired we slept really well hardly noticing the cockroaches. We woke early to see snow falling lightly on Red Square. I will never forget that sight. It was truly magical. On one side there was the Kremlin, opposite that there was the Main Universal Store (Государственный универсальный магазин), abbreviated to Gum (ГУМ), at one end there was the world famous , St Basil’s Cathedral, and at the opposite end the state historical museum. So after a breakfast of Salami, cucumber and rye bread we set off to see as much of the city as we could in one day. The best way to get around Moscow was, and still is, by Metro. It is very fast and very efficient. The stations are very deep under the city and the old escalators are incredibly long and steep, and move very quickly. They seemed to be made of walnut and formica and were lit by gas light which emitted a dim glow and a distinctive smell, reminding me of the lighting in my childhood home. Each station is different and they are all very beautiful. We got on at the Kremlin station which is decorated with sculptures and frescoes depicting characters from the Bolshoi Ballets. The ceiling was white porcelain with gold decorations; the walls, white and grey marble. The station was absolutely spotless with no adverts, no graffiti, not a speck of litter ~ just beautiful. A token to go anywhere on the Metro at that time cost 1000 roubles which was about 15p at that time. We travelled around the city stopping at various stations just to see them. One was a 1920’s art deco style. The walls were made of Onyx and there were alcoves with fabulous standard lamps made of bronze. Chandeliers hung from beautiful ceilings. The Metro stations were used as air raid shelters during the war as were our own in London. One of the Moscow stations has scenes from the war painted in huge cameos on the ceiling like modern day icons, in deep rich colours and sparkling gold. Eventually we returned via the Bolshoi station and walked to the Kremlin. 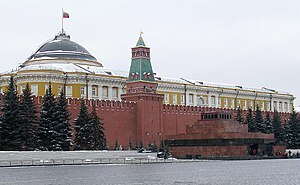 The word Kremlin means fortress and it is actually a walled city. There are 20 watchtowers on the walls, one with a famous clock. 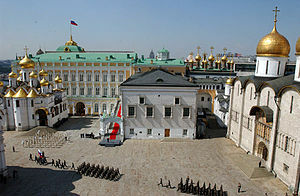 The Kremlin dates back to the 14th century, and the walls to the 16th; it was home to the Czars. On the way we passed the monument to the Unknown Soldier. This is a very beautiful and moving tribute sculpted in bronze. There is a cloak, sword and helmet, and an everlasting flame. Once inside the Kremlin we were in awe. At that time we were not allowed to take photos so those that I have of the spectacular buildings are from a later visit. There are so many churches all topped with gold domes and icon painted walls inside and out. We went into the Church of the Assumption, which, like most of the churches had been turned into a museum, but services were held 5 or 6 times a year. Every inch of the walls, ceiling and pillars was covered in exquisite icons. The old icons were painted on prepared wood using paints made from natural materials including crushed gemstones. The finished icons were covered in olive oil to preserve it. Unfortunately, over the centuries, the olive oil darkens and the icons get very dull. Many have been restored. Centuries ago, icons were the only Russian art and they all had a religious theme. Leaving the Kremlin we walked back into Red Square and visited Lenin’s tomb. Lenin died in 1954 and for a long time he was revered. However the cost of keeping his body in good enough condition to be on display to the public is enormous and, while we were there, people in Moscow were questioning whether it should continue. The body was almost luminous and we were rushed through by the guards. After a fleeting visit to the fabulously luxurious department store that is GUM, we were rushed to Sheremetova 1 airport for our domestic flights to Sochi by the infamous Aeroflot airline! I will write about that tomorrow. This entry was posted in Education, Musings, Travelogue and tagged Russia, Sochi. Bookmark the permalink. A grea read. I will definitely be back.